Wednesday marks the traditional Double Ninth Festival in China. The festival is celebrated on the ninth day of the ninth month of the Chinese lunar calendar every year, thus deriving its name "Double Ninth". The festival is also known as Chongyang Festival. Traditionally, it's a time when families gather to hike up hills, drink chrysanthemum wines, eat Chongyang cakes, and wear cornels but that's only one part of the story. The day is also seen as an opportunity to care for and appreciate the elderly. 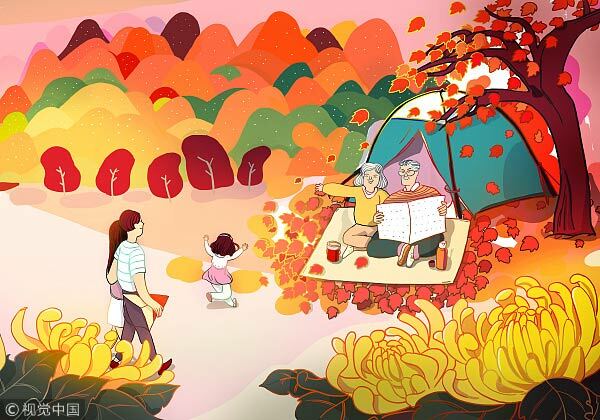 But first, let's take you through the old traditions associated with the festival by narrating its three origin stories, all of them are centered around a common theme - how to avoid disaster and prolong your life with proper preparation. In Han Dynasty (206 BC-AD 220), the Plague Demon from River Ru brought illness and misery to the nearby villages, and a lot of people died because of its evil deeds. A righteous young man, Huanjing, decided to kill the demon for the good of the neighborhood. He sought help from the god and learned swordsmanship and tricks to defeat the demon. One day the god told Huanjing that the monster is about to return on the ninth day of the ninth month to spread disease. As instructed by the god, Huanjing took all villagers to a mountain and taught them how to use the fragrance of chrysanthemum wines and cornels to drive the demon away. And when the monster emerged from the water, the scent of the plants and wine made him dizzy - which is when Huanjing killed it with a sword and stopped the plague. A long time ago, there was a family living on the foothills of Mountain Li. They earned their living by farming and were honest and warm-hearted. One day, a fortuneteller visited their home and requested them to allow him to stay over for a night. Although the family was not rich, all members welcomed him, treated him with a tasty feast, and slept on the floor to spare him a bed. While leaving the next day, the fortuneteller told the family to climb Mountain Li on the ninth day of the ninth month and instructed them to not return until noon. The family followed his advice and brought chrysanthemum wines and Chongyang cakes to enjoy the tour to the mountain. However, at noon, sudden floods in the valley destroyed all houses. It was then the family realized that the fortuneteller had saved their lives.